I'd like to be brief here because I'm not a rum lover. In addition, I find the PLV completely wrong. Sorry, but this bottle can not cost over 100 EUR. Since Glenfiddich has the best people to a good nose to conjure. And I do not even like him so much. There comes only standard like toffee with vanilla. Exotic and Floral. There is a lack of body. Too watery for 21 years. Especially where is the rum? Do not realize why this price was created. This whisky could be quite fair for 95 EUR sell. And that is borderline. Sorry. Medium and warm with a spicy sweet finish. But boring. Sweet, flavors of vanilla, banana, toffee, oak and floral. A soft whisky, again vanilla, toffee and oak. Spicy and slightly lemon. Rumcask is almost invisible. In the very first version, rum was clearly present. The finish is long and spicy, sweet with a bit of oak. very smooth nose with oak, vanilla and honey. Very pleasant! I have the 43,2% version where I already think that it is overwatered. 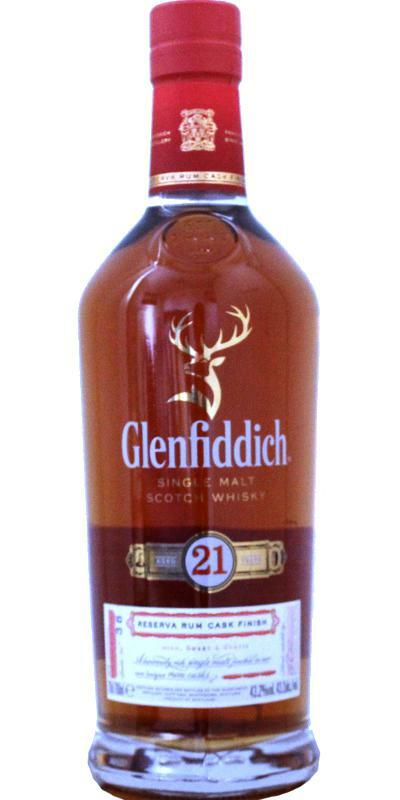 It is a smooth dram and it is nice to drink but the full palate of taste is missing. No bitter or over-oaked influence and all in all it is fruity and nice. I would love to try the cask-strength of this dram. Taste: At first mild, then stimulating, lively and dry, peppery, with notes of smoke, oak, citrus aromas, ginger and spices. Finish: Long lasting, warm, dry and spicy.